We all need easy, dependable recipes. Something you can just do. Well, this is it. To research this recipe, I read a lot of recipes. Lot’s of very odd things going on out there. Some of the recipes were not too bad, just non-specific. Not one suggested a grill temperature. No mention of surface temperature. Some even just said “preheat” with no suggestion of amount. A few would say to use “high,” but there is huge variability in grills so not helpful. There were other errors that make the recipes unworkable to the point of “did they really try this” and it showed in the comments. I wanted the chicken left intact. Not cut up or butterflied, I wanted simple. While I was going to season with just butter, salt, pepper, and garlic powder, it should be a basic recipe people could season to their taste. It should be adaptable to most grills. Note: All links are affiliate links meaning I do make a small amount from your purchases. Your price is not affected by this commission. I did have an alternative motive in doing a whole chicken. I wanted to play with my new toy. My toy is the new ThermaQ Blue from the fine folks at Thermaworks. But is it a worthy suggestion for Father’s Day? Now if you frequent this blog, you know I’m attached at the hip to my Thermapen thermometer. It seems like all I do is yell about cook to a final temperature and not by time. I do it over and over and over. When Thermoworks offered me there new ThermaQ Blue, I jumped at it. The ThermaQ Blue is a multichannel remote thermometer. It is competition accurate and connects by Bluetooth, and a Wi-Fi version is available. While I received the ThermaQ free to evaluate, there was no suggestion of a review (although I’m sure they are ok with that). But I love a good toy, and this is a really good one for Father’s Day, so I rushed a recipe for a test drive. My conclusion…. a great toy that any grilling father would love for years. First the quality of the construction. As always with Thermowork product, industrial grade. The build quality is always top of the line. They are calibrated and tested at the factory, and the certificate comes with it. 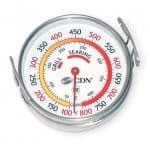 I ran my test with one of my most reliable surface thermometers. Yep, perfect. Next the Bluetooth. Apps are available for iOS and Android. Extremely simple to set up. One button to connect. Simple to set alarms and if you want, you can see a temperature graph ( important for the smokers out there). The range of the Bluetooth is stated as 150 ft. line of site. I went from my deck to my basement media room and still had a signal. Only about 50 feet but several walls and a floor between us and it still worked. I don’t guarantee you will get the same results but impressive. While there are multiple probes available, I had a meat probe and a grill surface probe which are part of the standard ThermaQ Blue Kit. I would say, they are exactly what a backyard warrior needs and considering the quality, they will last for years. My verdict. 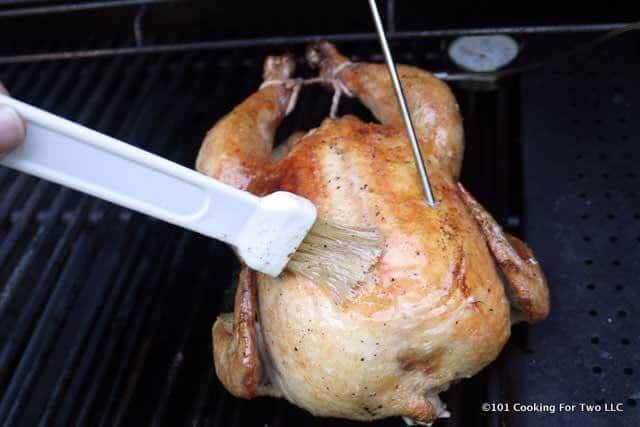 A wonderful, easy to use toy that will make grilling more accurate, easier and most importantly more fun. I will use this for years. The surface probe is easy to set up in seconds and monitored remotely. The meat probe is also great, but lots of my grilling involves a lot of flipping so not as useful as the surface probe to me. 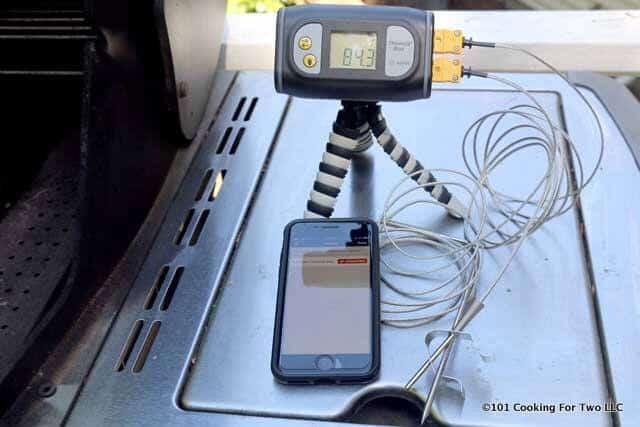 First, you do not need the ThermaQ to do this recipe, but you do need to be able to check the surface temperature and final meat temperature. My local store only had 5 to 8 pound whole chickens. I got the smallest at 5 pounds, but after removing the giblets and trimming some chunks of fat, I ended at a 4 pounds 3 oz. I would not be doing this with a very large chicken or small turkey. You can try but be sure the final internal temperatures are correct. I was trying to make this recipe ultra-simple. So no fancy this or that. No brine, no stuffing things under the skin or inside and no smoking. You can do those things if you want and the recipe will still work fine. If you want BBQ, give it a light brushing of your favorite sauce about 5 minutes before the finish. Now you have the best BBQ whole chicken. This recipe depends on indirect cooking. The chicken is cooked in an area of the grill with no heat under it while the other burners are turned on. Grills will vary how you do this. But it is not that hard. I don’t feel there will be enough drainage to require a drip pan. One side of the chicken will be towards the direct heat and get cooked faster, so rotation once in the middle is needed. I angle one chicken thigh and leg towards the direct side since you want their final temperature higher than the breast anyway. When I rotate in the middle of the cooking, the other thigh will be on the hotter side. When the breast hit 165, the thigh and legs were 185-190. Exactly where I wanted them. My recommendation for seasoning is a nice brushing of melted butter along with salt and pepper to taste. In my house, garlic is also required, so I went with my 7:2:2 seasoning. Start with setting up your grill for indirect cooking. Clean and oil the grates. Turn your burners that will be on to full and watch grill surface temperature. Aim for 350 to 400 degrees. Clean, trim and pat dry the chicken. Be sure to remove any giblets. I have a hard time not rinsing the interior of a bird. If you do it, do it carefully and clean up after done. 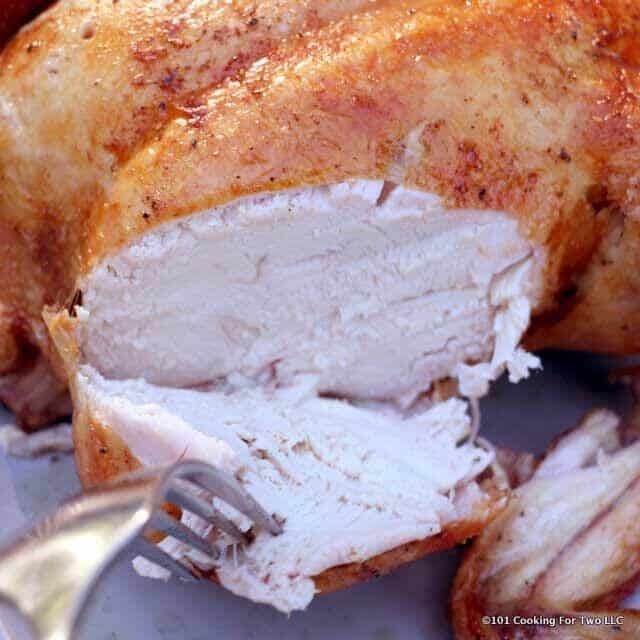 See my discussion on Chicken… To Rinse or Not To Rinse? 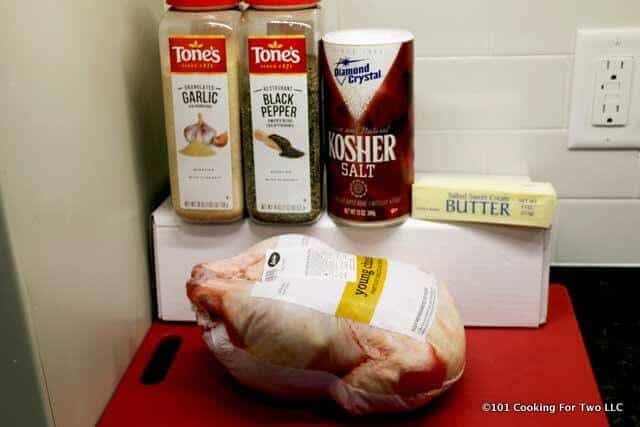 Melt 2 tablespoons butter in the microwave and brush all sides of the bird. Save the remainder for brushing the bird during the rotation on the grill. Season to taste with kosher salt and pepper. Garlic powder or other things if you wish. I used my 7:2:2 seasoning. Place on the grill with indirect heat angling one thigh and the leg to the direct heat side. Close the lid and don’t touch for 40 minutes. Rotate the bird at 40 minutes angling the other thigh towards the heat. 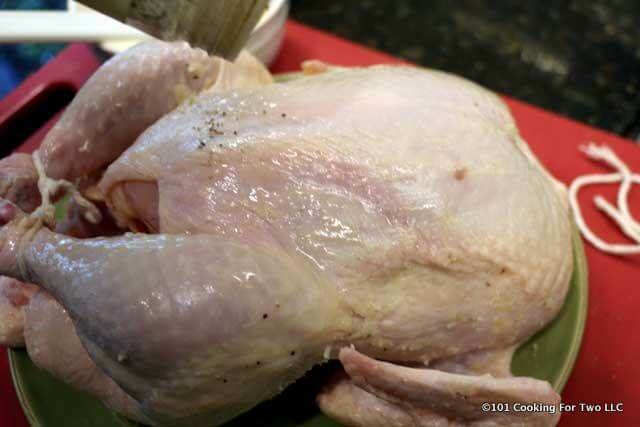 Give it a brush of butter and continue grilling until the internal temperature of the breast is 165. The easiest way to grill a whole chicken is just tossed on the grill. A little butter and some seasoning and you're ready to cook. There is no real secret. As Thoreau said, "simplify, simplify." 7:2:2 seasoning or just coarse salt and pepper - Or seasoning of your choice. 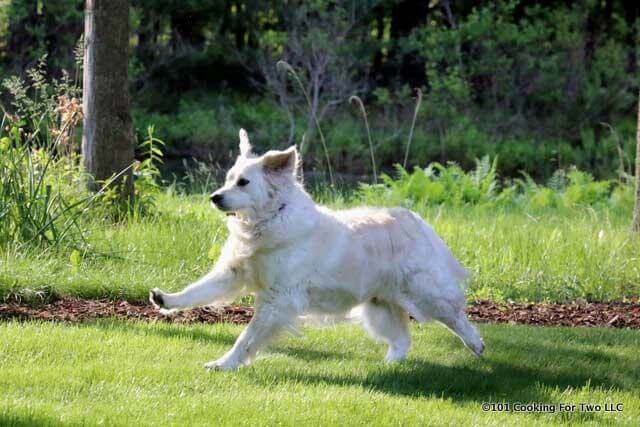 Clean, trim and pat dry. Be sure to remove the giblets. I have a hard time not rinsing the interior of a bird. If you do it, do it carefully and clean up after done. Melt 2 tablespoons butter in the microwave and brush all sides of the bird. Save the remainder for brushing the bird during the rotation on the grill. Season to taste with kosher salt and pepper. Garlic powder or another seasoning if you wish. I used my 7:2:2 seasoning. Place on the grill with indirect heat angling one thigh and leg to the direct heat side. Close the lid and don't touch for 40 minutes. Rotate the bird at 40 minutes angling the other thigh towards the heat. Give it a brush of butter and continue grilling until internal temperature of the breast is 165. Total cooking time for me was 80 minutes. A good estimate of cooking time is 15-20 minutes per pound. 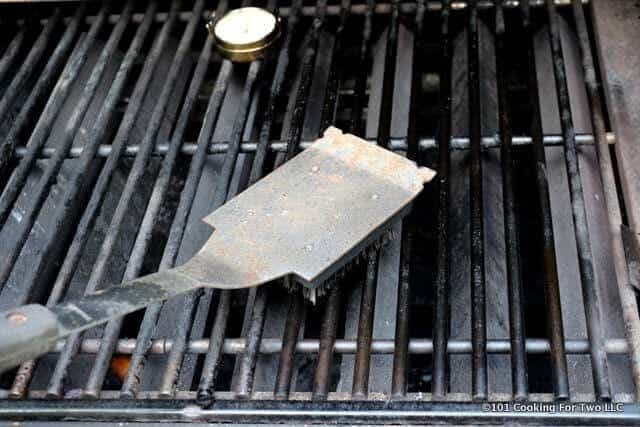 Get the grill set up correctly is the key to doing this right the first and every time. 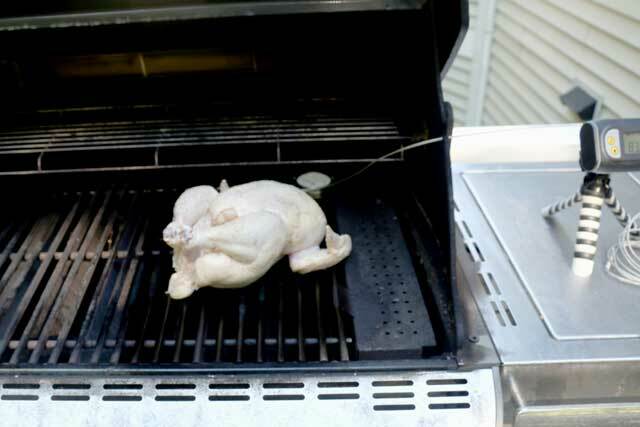 Grill surface temperature and the internal temperature of the chicken must be monitored. Dr Dan: this was a terrific recipe. The amount of detail was impressive and added so much to the recipe (e.g., the drippings, the resting—never think about that for chicken, and the timing being spot on). Really great work. Went w a basic garlic and onion on it. Want to try the 7-2-2 next time. Glad you enjoyed the recipe. It is so simple but it is the details that count. 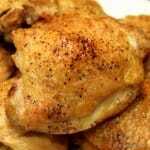 I am so looking forwadd to making this chicken this coming BBQ season. 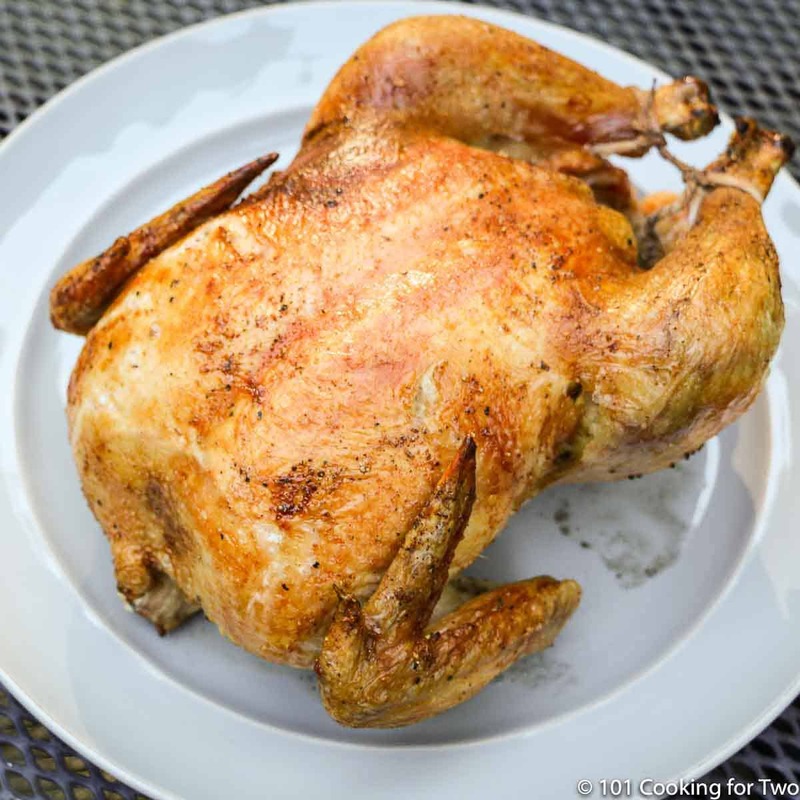 I used to make beer can chicken, but it seems like the lids on gas grills are getting shorter, so I can’t stand the chicken up on my current grill. I am also going to look into getting a ThermaQ Blue. Keep up the good work Dr. 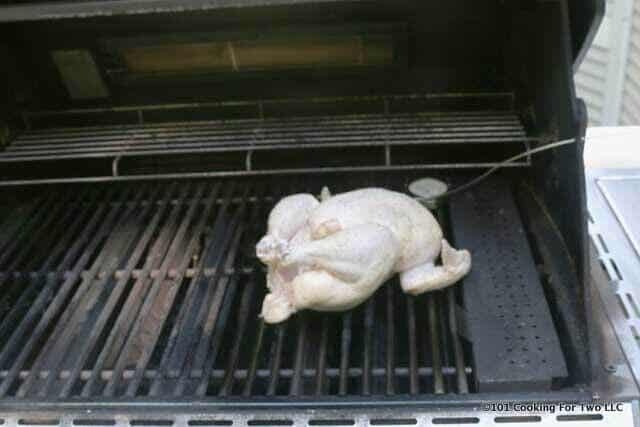 I have never had a grill that would handle a chicken standing up. The ThermaQ is just a nice toy and I do love toys. Not required for this recipe. About a pan… I did not test it that way and believe it may interfere some with the cooking/browning. So I would not do it. This is not a mess like pulled pork. You can try it if you want and be sure to watch the internal temperature to determine when it is done. How does it work if you turn the side burners both on and put the chicken in the middle one that are unlit? The answer… I think it would but have not tried it. The surface temperature in the center of the grill needs to be 350 but the thighs would be pointed to the heat and get some radiant energy. 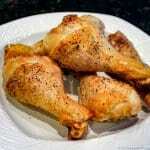 If you try it, watch the internal temperature of the thighs and breasts closely. You also want the legs in the 185 range. 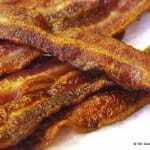 I’m new to the BBQ game and I found your website looking for recipes and now it’s may go-to resource! I’ve done your ribs and pulled pork, and will be trying out this chicken this weekend. Just wanted to leave a note to say thanks for being so informative and helpful in all of your posts. Your hard work is not unnoticed! I am an avid BBQ nut, I Q everything. I take the chicken after cleaning and rub it with Virgin olive oil, add poultry seasoning,ground black pepper, and Rosemary Sage infused sea salt. Put the bird on the top rack on one side, turn the other side far burner to high, the next to Med and the third to low. No heat on the burner below the bird. Close the lid rotate after 30 mins close the lid and it’s done at 50 mins. Never Fails! It is great to know your grill so well. Thanks for the discriptioon. I love my non-wifi Therma-Q. 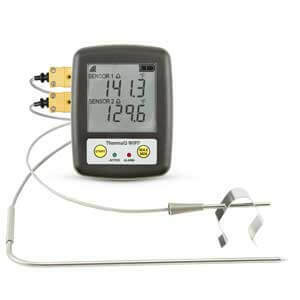 It is my favorite remote probe thermometer that I own (I also have a DOT, 3 Chef-Alarms, and some others). I’m on the fence about getting one of the wifi ones because I already have 5 perfectly good units, ha ha. 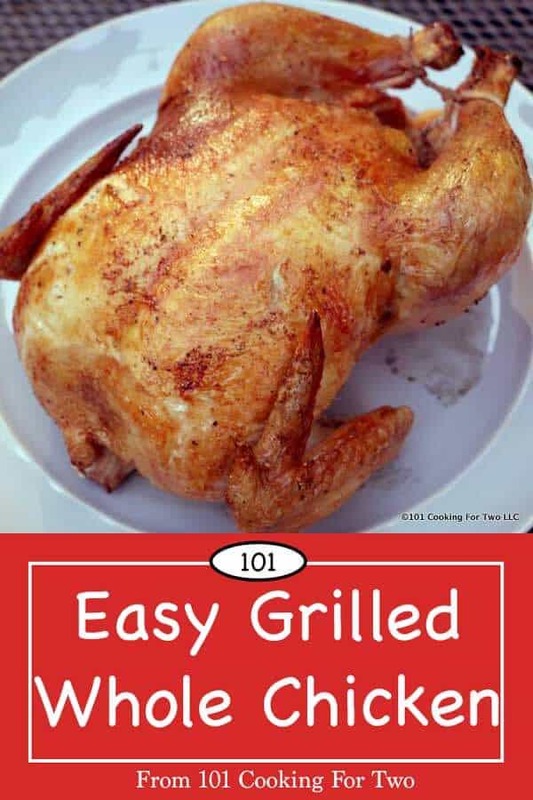 Recipe sounds easy (great for novice grillers) plan on making as soon ask buy a new grill. Any suggestions on best natural gas grills? Thanks for the note. It is so easy. I just couldn’t find instructions anywhere so I just winged it. I’m on my second natural gas grill. They seem to last forever compared to propane. The propane grills burn hotter (and dirtier). I think since they are more “mass market” they tend to be made cheaper. My current grill is a Weber with impressive quality. The first was a brand I had never heard of MTD or MDT or something like that. It seemed fine also. There are grill review sites but really I think most all of those sites are just glorified Amazon link farms and don’t trust them. You might check AmazingRibs.com. 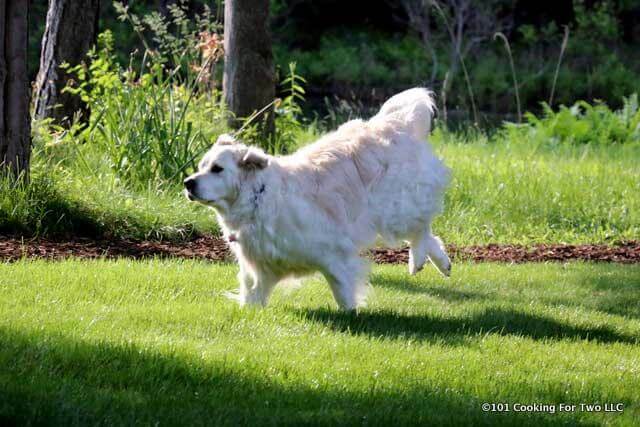 Meathead, the original owner now has control of it again so I trust it more again. Great post. I’m a big fan of Thermoworks products. I have two Thermapen thermometers and the pre-bluetooth Chefalarm. Don’t know what I’d do without them. Yep, it was near perfect, especially considering that the technique was basically just tossing it on the grill and rotate it once. 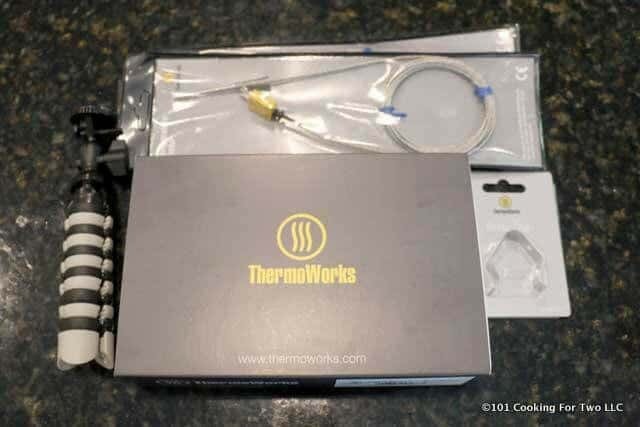 I “love” all things Thermoworks and this one is a winner.